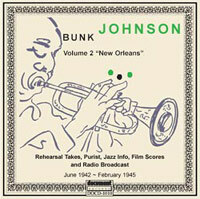 Bunk Johnson CDs available from Document Records. 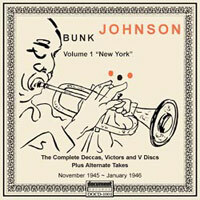 Document Records are proud to present the re-issue of Bunk Johnson Volumes 1 and 2. Both CDs have been digitally remastered, with new cover artwork and booklet notes by Howard Rye and Alyn Shipton. Volume 1 has Bunk playing with his New Orleans Band and features recordings made for Decca, Victor, V Discs and alternate takes between 1945 ~ 1946. Bunk by name, Bunk by nature. For years Bunk Johnson kept Jazz historians on their toes by making up all sorts of stories about his life and the early days of jazz. The false stories start at the beginning of Bunk`s life. According to Bunk he was born Willie Geary Johnson, in New Orleans, on 27th December, but in reality he was probably born 10 years later in 1889. He was at the forefront of the early New Orleans jazz scene, playing in bands probably from 1907 to 1914. 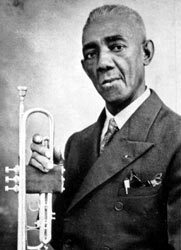 Although he was never a pioneer member of Buddy Bolden`s band, it was never disproved that he was indeed the man whom Sidney Bechet, Zutty Singleton and Lee Collins remembered hearing in New Orleans when they were growing up. He left New Orleans in 1915 and travelled around upstate Louisiana playing in minstrel shows, theatre orchestras, circus bands, and with the Black Eagle Band. Whilst playing with the Black Eagles in 1930 the band`s other trumpet player Evan Thomas was stabbed to death on the bandstand. A fight broke out and Bunk`s instrument was damaged. After this incident Bunk continued to play a from time to time, using a borrowed trumpet, but his heart was not in it any longer. His teeth were also starting to give him troubles and by 1931 Bunk had effectively retired from playing and spent the rest of the decade driving a truck, being a laborer, and as a WPA funded children`s music teacher in New Iberia, Louisiana. In 1938 Bill Russell and Fredric Ramsey started to write their book, "Jazzmen". After interviewing several Jazz musicians, including Louis Armstrong, Bunk`s name kept coming up as one of the early influential jazz musicians in New Orleans. They managed to track him down and interview him in New Iberia where he was still living. Out of this interview Bunk started off on what would be the second part of his career. A collection was taken up among musicians to buy him a a new set of teeth and a new horn. The basic elements of the band heard on this CD were recruited for his first session for the Jazz Man label on 11 June 1942. It has often been insinuated that he was in some way saddled with George Lewis and the others through the romantic notions of his backers, but it appears that he himself originally suggested Lewis, who had worked with him in Evan Thomas’s band in 1931, shortly before his effective retirement from professional music. Three members of the band heard here were recruited on this occasion. Lewis, at nearly 42 years of age, had not previously recorded. Trombonist Jim Robinson, born in Deer Range, La., in 1892, was a veteran of the justly revered Sam Morgan sessions of 1927, and had also been a member of Kid Rena`s band when it made the first recordings of the New Orleans renaissance in 1940. Banjoist Lawrence Marrero, a few months younger than Lewis, was Lewis`s regular banjo player. These associations continued through the long series of recordings for Bill Russell`s American Music label. For these, drummer Warren "Baby" Dodds was recruited by Russell and brought down from Chicago. Perhaps the greatest traditional-jazz drummer, he had had wider public exposure and was already well known to record collectors and enthusiasts. Bassist Alcide "Slow Drag" Pavageau was a regular associate of Lewis`s. Few bodies of music can have aroused such extreme and contrary reactions, but these reactions seem increasingly ridiculous. The playing of George Lewis and Jim Robinson will always be regarded more highly by those whose interest is in intense personal expressions than by those who seek polish, finesse or sophistication. It is not obvious why this dichotomy, which can be found throughout the arts, should in this case have generated such ill-tempered conflict, unless it be that one of its prime instigators was Bunk himself. As his new career developed, the trumpeter evidently became increasingly aware of the gulf between his own relatively formal musical aspirations and the folk music of his band, whom he eventually came to describe contemptuously as "emergency musicians”, perhaps reflecting in which he had originally worked with them. His discontent came to a head during their engagement at the Stuyvesant Casino, New York City, where they opened on 24 September 1945. The "American Music Band" was used with the addition of pianist Alton Purnell, a younger musician born in 1911, who had been working as an accompanist to Blues singer Cousin Joe at the Famous Door in New Orleans`s Bourbon Street. For most of the musicians, this was their first regular engagement in the North. Disputes over repertoire and presentation were present from the start and both Lewis and Robinson had to be discouraged by the backers from returning home. Baby Dodds`s showmanship caused the leader a different kind of aggravation, and clearly personal as well as musical animosities were involved. It is perhaps astounding that the Decca records made in November are as good as they are. Aficionados of the band tend to compare them unfavourably with the American Music sessions, though by contrast establishment jazz critics of earlier years tended to value them more highly. The authors of Jazz On Record (1960) refer to "a remarkably in-tune band." They are certainly among the best recorded of the band`s output, to the particular benefit of the drums, and Tishomingo Blues is outstanding. By the time they recorded for Victor in the following month, Lewis had had all his upper- teeth out, and his playing is distinctly below his best. He told Bill Russell he was "deliberately keeping out of high register." The band is also much less well recorded. Reportedly Dodds`s drums were muffled with a mattress. Certainly the piano is in appalling condition and one fears that the A&R men somehow thought this `authentically appropriate for the music! It is a dreadful irony that thanks to the major-label promotion and distribution these records were much widely circulated than any others by the band and heard across the world by people for whom the American Music issues, with their pressings of a few hundred, were as accessible as the Holy Grail. With hindsight, they offer more pleasures than might be expected from the circumstances of their making. By the time of the final session heard here, recorded for V-Disc at the Stuyvesant Casino itself, Baby Dodds had deserted, suffering from health problems probably aggravated by his conflicts with Bunk. He was replaced by a mystery man named Red Jones, often suspected of being a pseudonym, but Richard Sears claims he was a drummer active in Greater New York at the time. It is odd that such a mystery should arise with a band so much in the enthusiasts’ eye as this was. Lewis now had his new false teeth and sounds very un-used to them, cautious to the point of being unrecognisable at times. The records also reveal Purnell struggling with a piano quite as bad as that provided by Victor! Thankyou to Howard Rye for these notes. A band was recruited by the hit or miss method of driving from bar to bar in New Orleans, seeking out players who had been recommended to Russell by word of mouth. In fact few of those originally mentioned were located, or - once they had been found - agreed to play, since this was to be a non-union session, and therefore automatically disqualified players like banjoist Johnny St. Cyr. Then Bunk recalled a clarinettist who had been alongside him a few years earlier at a dance when bandleader Evan Thomas was violently murdered. The clarinettist was called George Lewis, and he was a friend of Jim Robinson - the trombonist who had appeared on Sam Morgan`s famous 1920s recordings. Before long, alongside George and Jim, the team had recruited bassist Austin Young (uncle of Count Basie`s saxophonist Lester Young) and pianist Walter Decou. When they eventually gathered in a piano storeroom upstairs at Grunewald`s music shop, the band was filled out with banjo player Lawrence Marrero and drummer Ernest Rogers. Nine full sides were cut on June 11th, and eventually issued along with discs of Bunk reminiscing. “Moose March” and “Those Drafting Blues” were the rehearsal takes, offering us the earliest ever glimpse of Bunk`s band playing to be recorded. Gene Williams then brought a similar line-up into the San Jacinto Hall on October 2nd to make fourteen sides, with bassist Chester Zardis and drummer Edgar Mosley substituting for Young and Rogers. More significant was the replacement of Jim Robinson, whose marvellous timing had so enlivened the Jazz Man sides, with brass band veteran Albert Warner, who managed little better than pedestrian vamping. Zardis`s strong slapped bass and Lewis, playing his own instrument rather than the borrowed horn he had used in June, are the stars of the session especially on the heartfelt first take of “Franklin Street Blues”. On this occasion, Bunk opted to play some unusual pieces from the dim recesses of his memory, negotiating complex ragtime pieces with ease (and much more confidence than his fellow musicians) while also throwing in a few popular songs of the day. “The performances are arranged the way Bunk wanted them,” wrote Gene Williams at the time, “few solos, emphasising the creative strength of the old-style New Orleans ensemble. Bunk went on to made further recordings in the West with Bob Scobey and Lu Watters as well as under his own name. Later he went on to cut more sessions for Bill Russell in New Orleans. In 1945 Bunk went North, but before he set out, first for Boston and later New York, he made two Louisiana recording sessions that constitute the final part of this CD. Four sides were cut by Gus Statiras for a film, and featured a similar band to the Jazz Man and Jazz Information sides, (effectively the basis of Bunk`s group on Bill Russell`s American music label). The new name here is Abby Williams (initially misnamed Kid Collins) on drums. “Weary Blues” offers an opportunity to compare Robinson`s vital trombone playing with the relatively uninspired work of Warner, and despite Statiras’s inexperience as a recording engineer, the sides hold up well alongside other examples of Bunk`s work. The final track from an “Esquire” pollwinners` concert, has Bunk guesting with an allstar band led by Louis Armstrong. Although the broadcast ended during the one and only side Bunk and Louis made together, this was taken as confirmation by many of Bunk’s admirers as proof positive of the master/pupil relationship talked of by Bunk, never denied by Louis, and seemingly confirmed when Louis made the trek to see Bunk at home in New Iberia during his final illness in 1949. Thank you to Alyn Shipton for these notes.